Yet another global digital agency goliath has extended its reach into Australia, opening its doors locally off the back of existing digital specialist consultancy, Webling. Mirum was created in 2015 following J Walter Thompson’s decision to integrate 11 different agencies into one consolidated offering. The group sits under the WPP umbrella and now extends into 24 countries, making Australia its 25th. The focus is on business transformation, experience design and commerce activation and it’s positioned as one of the fastest growing divisions within the broader JWT group. Webling, meanwhile, was established in 2004 in Sydney and acquired by WPP in August 2015. It currently has 17 staff. Under the new structure, the Webling business will be incorporated wholly into the Mirum network, which is being led by managing director, Claire van Heyningen, who joined the group in February 2018. Van Heyningen has a history in digital and technology consulting and was formerly group head of digital at M&C Saatchi. JWT CEO for APAC, John Gutteridge, said combining the strengths of a digital brand like Mirum with the local expertise of Webling was a no brainer in the quest to build digital leadership in this region. “This is an exciting next step for Claire and her team, and the strength and breadth of the local team’s capabilities will make it a competitive market player,” he stated. In the six months since joining, the now Mirum Australia business has brought on a number of clients including Exchange for Change, digital banking upstart, 86 400 and Bravecto. It’s also worked on brand experience transformation work with the Entertainment Book, Subway and NSW Health. Mirum global CEO, Dan Khabie, said Australia was perceived as a high-growth market opportunity and noted the “robustness” of digital marketing communications across Australian brands. “Mirum is about making what’s next and Australia gives us a unique opportunity to work with a new set of diverse clients in a region that is seeing huge growth around digital technology,” he said. 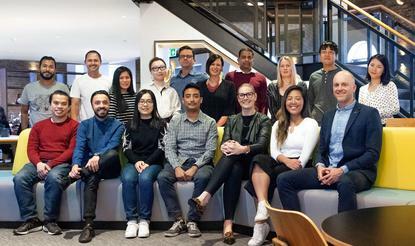 News of Mirum’s debut comes as rival agency giant, Dentsu Aegis Network, confirmed its data and technology agency arm, Merkle, has acquired local marketing cloud specialist, Amicus Digital, to expand its Australian reach. Merkle, which is part of the Dentsu Aegis Network (DAN), made its debut locally in March when the group took on and rebranded the Columbus data marketing business to Columbus, a Merkle Company. Amicus Digital is now being rebranded to Amicus Digital, a Merkle Company.